Wayne State University is hosting its third annual hackathon: HackWSU 2017, May 19-21. The event is sponsored by Wayne State's entrepreneurial resource office, Innovation Warriors and is being powered by AngelHack, the world’s largest and most diverse hackathon organizers, and the local Detroit tech community. During the three-day weekend, Wayne State will turn into a computer programming hub where beginner, intermediate and advanced hackers will come to learn, compete and develop software, or hardware projects. Mobile apps, Internet of Things (IoT), web applications, robotics, drones, and all things “tech” will be worked on by the participants. There will be seasoned tech coaches to demonstrate and aid the participants in their tech quests, great food, demos, and an exclusive invite into AngelHack’s HACKcelerator program for the winning team. New additions to the 2017 event include a partnership between Wayne State and AngelHack, a female-owned, female-majority company that is the world’s largest and most diverse global hacker community, for the purpose of promoting HackWSU globally. AngelHack will increase the amount of tech coaches available and bring IBM, HP and Amazon Web Services to provide demonstrations and tech support. This HackWSU will be bigger and better by being "powered" AngelHack. Another new addition within HackWSU is #CodeDetroit, a Digerati Girls / Digerati Kids hackathon for youth, sponsored by Flyball Labs and led by EcoWorks. #CodeDetroit is focused on middle and high school students and allows them to build tech apps and explore digital entrepreneurship. Winners of #CodeDetroit will receive prizes of up to $1,200 in value. Minors under the age of 18 are invited to extend the experience and stay late or overnight each evening with a parent or guardian. HackWSU is the kick-off event to Detroit Startup Week, which starts Monday, May 22 and runs through May 26. Also part of Detroit Startup Week, a free Small Business Legal Academy will be co-located in the Wayne State Undergraduate library with HackWSU on Saturday morning, May 20, 2017. The sessions will showcase four interactive panels covering intellectual property, real estate law, employment law and business structure/formation. Hackers participating in HackWSU, plus the startup and small business community at large, will be able to receive much needed input from several lawyers from Michigan's largest law firms. HackWSU is produced with the generous support of the Wayne State University College of Engineering, Michigan’s largest business incubator and Wayne State University partner TechTown, local IT support firm Flyball Labs, venture capital firm City Side Ventures, current Innovation Warrior students, and Argonomo, a branding and development company out of Farmington Hills that designed the HackWSU website inspired by 8-bit Nintendo video games of old, like “Zelda” and “Super Mario Brothers”. "We are opening Wayne State University's doors to the entire hacker community of all levels and all ages, and we want to encourage them to keep creating and innovating, not just during our hackathon, but throughout the year," says Aubrey Agee, Director of Innovation Warriors. 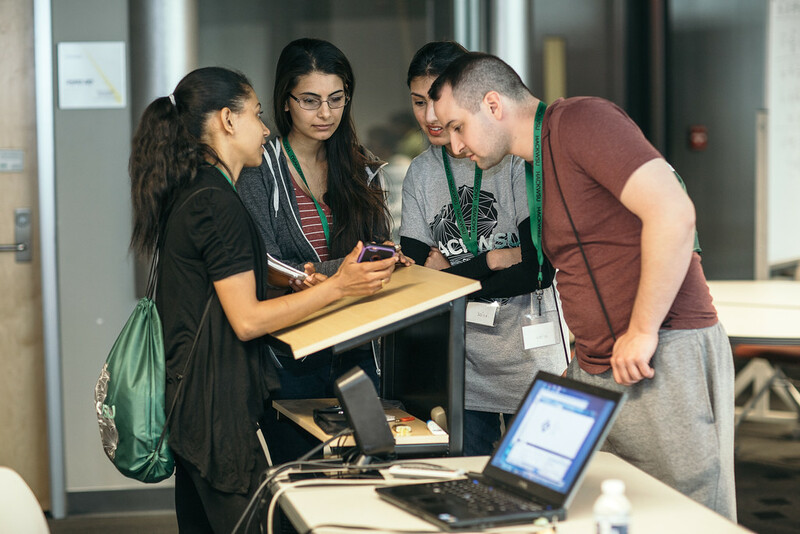 HackWSU is not just an annual hackathon but it is a year-round movement that invites the tech community to come to Wayne State and coach the hacking community in programs such as the recent weekly Detroit Hacker Nights led by Detroit Labs and GE Digital. HackWSU 2017 is open to ages 11 and up, to students (middle, high school and college) and the general coding community. For more information, or to register for HackWSU 2017, visit HackWSU.com, call (313) 577-1533 or email innovationwarriors@wayne.edu. Space is limited. AngelHack, a female-owned, female-majority company is the world’s largest and most diverse developer ecosystem, helping to drive open innovation of tech products, platforms and brands with extraordinary smarts, scale and speed. Known as pioneers of global hackathons for more than five years, AngelHack’s 125,000+ developers, designers, and entrepreneurs around the world compete to build, test and launch new solutions over the course of a weekend. The HACKcelerator program and other education initiatives connect ambitious developers with thought leaders and experienced entrepreneurs to help them become more versatile, entrepreneurial and successful as change-makers. Find out more at www.angelhack.com. Startup Week™ brings entrepreneurs, local leaders, and friends together over five days to build momentum and opportunity around Detroit’s unique entrepreneurial identity. Detroit Startup Week is led by entrepreneurs and hosted in entrepreneurial spaces all over Detroit. Tracks include technology, entrepreneurship 101, mobility, music, food-preneurship, growth-stage entrepreneurship, design/art, civic innovation, retail entrepreneurship, place-based entrepreneurship, medtech, fintech, social entrepreneurship, Internet of things (IoT) and youth entrepreneurship. This Techstars initiative can be found in dozens of cities worldwide. Detroit Startup Week is powered by Chase for Business and made possible by Chase, Quicken Loans / Rock Ventures, Google, Pixo Group, AMBR Detroit, Parallel Ventures and many others. To learn more or register, go to https://detroit.startupweek.co/.